Tim Evans Receives Prestigious Award... - Evans Title Agency Inc.
Tim Evans, owner of Evans Title Agency, Inc., was the recipient of the 2012 Ohio Land Title Association (OLTA) Meritorious Service Award. 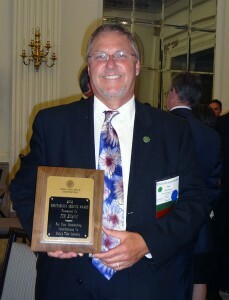 Evans Title Agency, Inc. owner, Tim Evans was the recipient of the 2012 Ohio Land Title Association (OLTA) Meritorious Service Award. This award recognizes persons who have provided outstanding contributions over many years to the title insurance industry. It is intended as a high honor of the association to those who are not yet eligible for the Honorary Life Membership Award, but who have otherwise provided significant contributions to the industry and the association.